What’s a two-word phrase for Sunday-morning bliss? 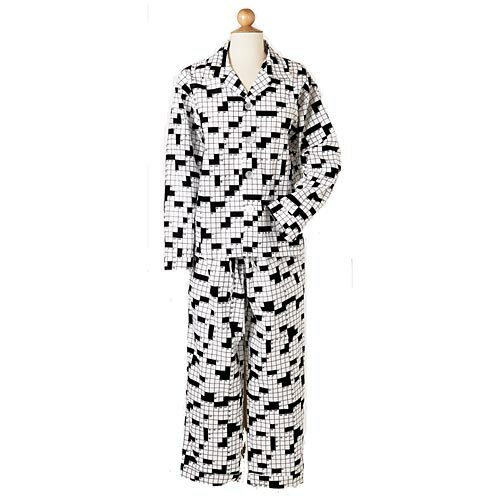 F-l-a-n-n-e-l j-a-m-m-i-e-s.
100% cotton, sizes S(4–6), M(8–10), L(12–14), XL(16). Looking for more than a bath? These all natural, handmade bath cubes will surround you in a champagne of happy effervescence. Each cube is chock-full of ingredients specially formulated to address your stress - whether it be a cold, muscle ache, lethargy, insomnia, general under-the-weatherness, or yes, even just plain stress. Toss the cube under running water as you draw your bath and you can look forward to a soothing, rejuvenating, soak. 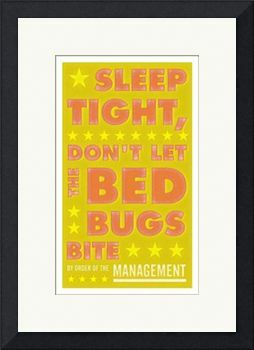 According to Diana Gross, MD, a dermatologist, in Self magazine (October 2007), we should not be sleeping on cotton pillowcases - it doesn't allow skin to glide over the surface. Over time, the repeated pressing can lead to permanent creases...on your face. She suggests using a silk or synthetic satin pillowcase. Let's face it...it's too hot to do anything else. The cots are covered in Shabby Chic fabric. 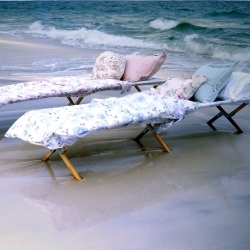 (And you could just use it for sleepovers and such if you don't have any sand near you.) Or put it on the front porch next to a fan. Close your eyes and pretend. 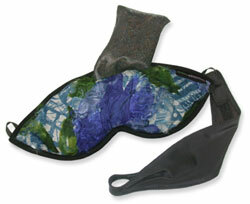 Relax with the Dream Essence™ Sleep Mask and sleep tight in the calming scent of lavender and chamomile. 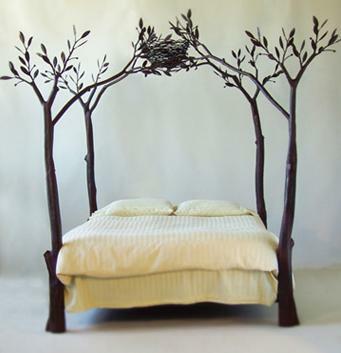 This beautiful bed created by Shawn Lovell Metalworks. I will also need a new house with really high ceilings too, please - so it will fit in my bedroom. This Floating Bed hovers - with the aid of thin cables and powerful magnets. It can support almost 2,000 pounds. Wake up with a smile! 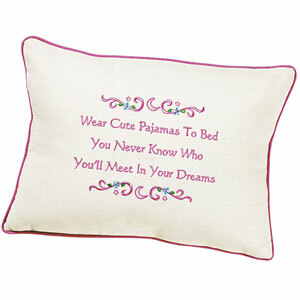 ;) Pillow says, "Wear cute pajamas to bed. You never know who you'll meet in your dreams." Removable cover is piped in pink trim. 9" x 13".